Kyle Kritz was on an offshore fishing trip when he landed the catch of a lifetime. The fisherman caught a shark GPS-tracker tag. Mr. Kritz and his friends were looking to catch tuna on a fishing excursion with Voo Doo Fishing Charters looking to catch tuna. The group was fishing an underwater salt dome off the Mississippi river called East Lump. Kritz had put out his line and ended up hooking a scalloped hammerhead shark. The angler fought the shark for around 30 minutes while following it for about a mile and half in the boat, before the fish broke free. Upon reeling in the line, the fishermen were shocked to find, what looked like a large pile of algae. Then they saw the intermediate red blinking light and realized it was something important. Stephen Babcock thought the device might belong to the Louisiana Department of Wildlife and Fisheries and took the device with him after the trip. Since the LDWF were closed for the weekend, Mr. Babcock posted a photo to a popular fishing forum. There he learned that it was a GPS-tracking tag and shark researchers began contacting him for more information. 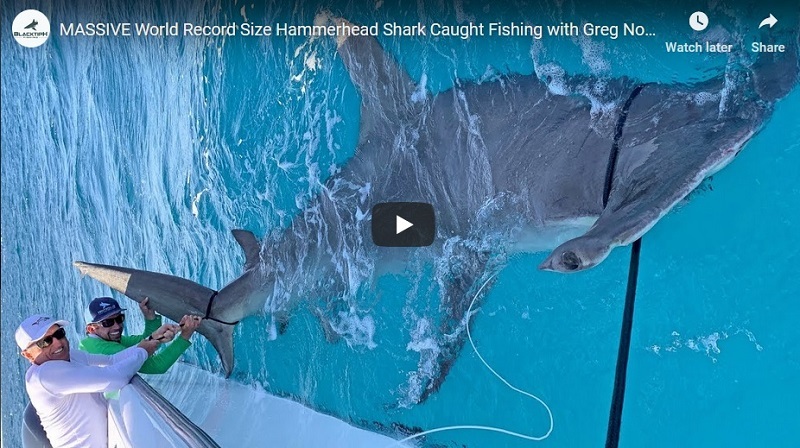 He learned that the tag was attached to the dorsal fin of an 8-foot scalloped hammerhead shark in January of 2015 by the LDWF. Mr. Babcock believes the hammerhead swam by the fishing hook, which then snagged onto the tag. Eventually so much force was put on the tag it pulled off the sharks fin. October 17, 2018 Ron Babington Comments Off on Big sharks. Inhabitants of the abyss or residents of the shallows? Big sharks. Inhabitants of the abyss or residents of the shallows?